Nehemiah challenges the people of God to labor on the wall and in return, the names of their fathers will be written in the annals for future generations to cherish. But Adah has one sister and no brothers. Will her father, who rules a half-district of Jerusalem, be forgotten forever? 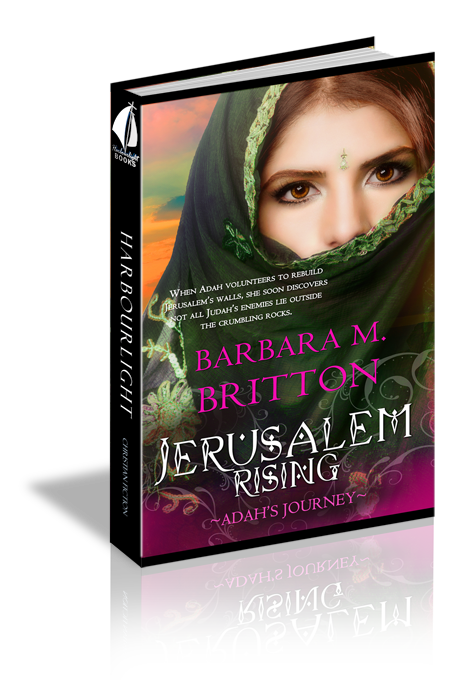 Adah bravely vows to rebuild her city’s wall, though she soon discovers that Jerusalem not only has enemies outside the city, but also within. Can Adah, her sister, and the men they love, honor God’s call? Or will their mission be crushed by the same stones they hope to construct? Question 1: In the book of Nehemiah, Nehemiah prays to God before he enters the king’s presence, and during his request to be able to restore Jerusalem’s wall. How often do you pray? Are there ways you can spend more time talking with God? Answer 1: We can always spend more time with God. When we focus on God and His Word, the troubles of life are put into perspective. We are blessed to be able to have a conversation with the Almighty God. Question 2: Adah volunteers to rebuild Jerusalem’s wall to honor her father and her family. What drives us to volunteer for jobs or positions? Answer 2: We volunteer for many reasons: a passion, prestige, conviction, peer pressure (good or bad), giftedness, etc. Question 3: When Adah loses someone she cares about, she continues to do God’s work and fight for justice. Have you ever had to cope with a loss? How did you handle it? Answer 3: I have lost people close to me. Through those times of grief, I relied on God's strength and the fellowship of friends and family. Time does make the sting of loss lessen. Question 4: Nehemiah and the Israelites faced many challenges rebuilding the wall. Name some of the obstacles they had to overcome. Question 5: Who was your favorite character in the story? Share your reasons why. Question 6: Nehemiah 8:10 states, “Do not grieve, for the joy of the Lord is your strength.” Share an example from your own life where the Lord gave you strength. Answer 6: I am a cancer survivor. I drew strength from the Lord during my treatment. God was faithful to me and my family. Question 7: What was your favorite scene from the book? Question 8: Adah recites Scripture as she leaves her city to face the king’s envoy. What Scripture gives you comfort in trying times? Question 9: I love to listen to Christian music. Can you think of a song that would be a good theme song for this book? Question 10: Adah creates perfume. What is your favorite fragrance?